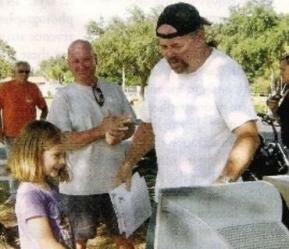 Greg Reaster has refurbished and given away more than 800 computers to poor children around the Tampa Bay area and beyond since he started BIKERSCAP about 10 years ago. On May 31, 2011 BIKERSCAP Inc. set upon a mission to place many computers with students via each individual school, targeting Pasco County, Fl. we approached administration for assistance with placing these computers in the hands of the children that need them the most, we feel the administrations for these schools did a fantastic job of placement for these tools we see as necessary to get a quality education via the public school systems, much thanks to Mr. Preston Rudie, Reporter for WTSP, an ABC affiliate (Channel 10, local) for the excellent coverage for this donation at Charles S. Rushe Middle School where BIKERSCAP Inc. donated a total of 3 units at once to some very surprised and grateful students, we all here at BIKERSCAP wish these youths the best in the coming year, hopefully, our “tool” we provided will assist them in a bright and prosperous futures! BIKERSCAP Inc. donated other systems at Connerton Elementary School later in this day to make a one day total of 5 computer systems donated. 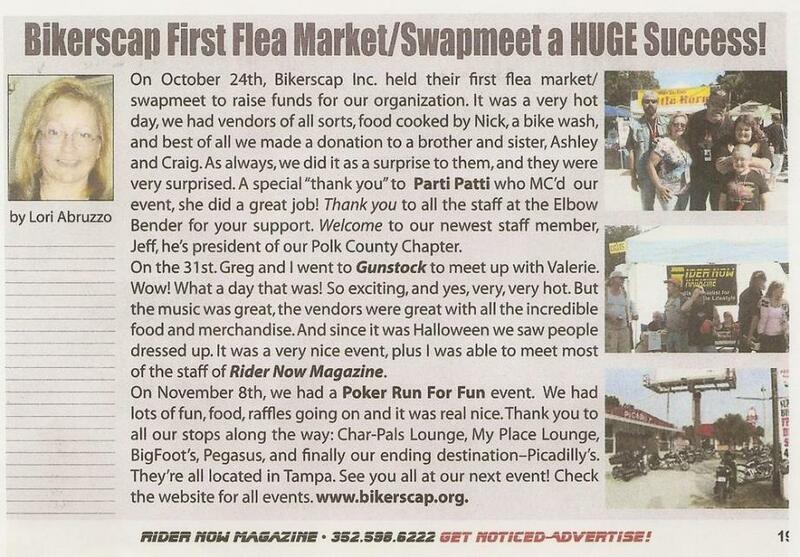 Tampa Tribune Reporter Geoff Fox visited BIKERSCAP Inc. facility and spoke with Greg Reaster here is the article written and published in the Pasco Tribune. Greg Reaster talks about his non-profit Bikerscap. He and other volunteers build and repair computers for students around the Tampa Bay area. The computers are distributed for free to kids who might otherwise not have access to a computer. At 6-foot-3 and about 270 pounds, Greg Reaster is an imposing man. Put him on the back of his 1998 motorcycle – “The loudest Harley-Davidson in Tampa,” he says – and the accompanying leather jacket and gloves don’t make him look any less intimidating. But inside Reaster’s barrel chest beats a heart filled with good intentions. 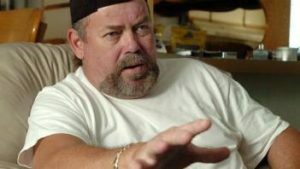 During the last two years, his organization, BIKERSCAP Inc., has refurbished and donated about 100 computers to disadvantaged children around the Tampa Bay area, but mostly in Hillsborough County. BIKERSCAP stands for Building Intellect Knowledge Education Resources & Schooling with a Computer Acquisition Program. 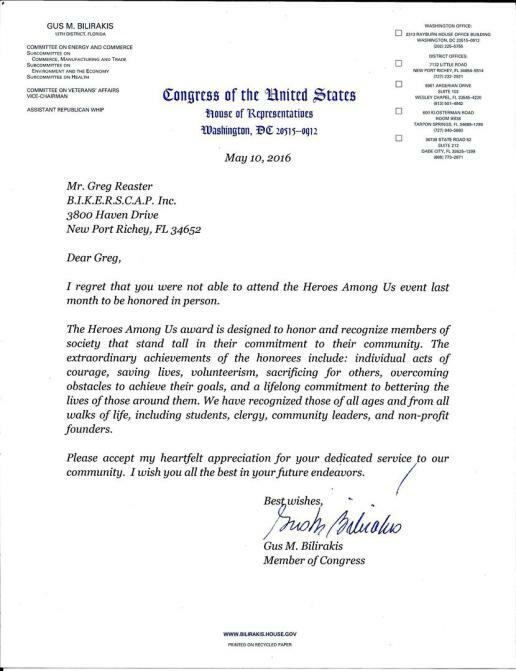 Computers and money are donated to the organization by local businesses and residents. Many computers have come from Raymond James Financial Inc. in St. Petersburg. Debbie Valentin, who works in the warehouse at Raymond James, said the company donates computers once used by its employees, but she wasn’t sure how many the company has donated to BIKERSCAP. The refurbished computers are meant for children from families without a computer, or not enough computers. There is an application process during which Reaster, or other volunteers, interview an applicant, as well as their parents and teachers. “They have to need them, and prove why they need them,” Reaster said. 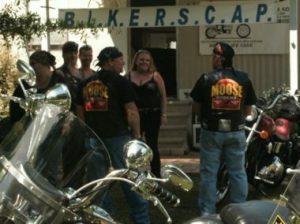 Applications and other information can be found at the organization’s website, www.bikerscap.org. 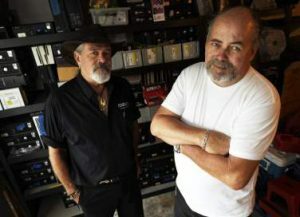 On a recent weekday, Reaster nodded to a corner of his modest home, which is lined with computers and parts. There were a dozen or more computers ready for delivery. A Tampa native, Reaster said he was a project manager for a commercial construction company before the economic downturn left him jobless. 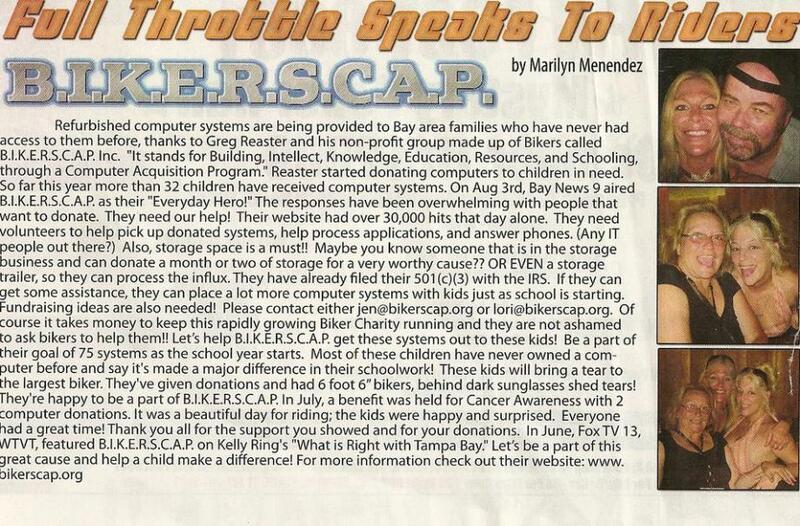 The idea for BIKERSCAP was born a couple of years ago, when Reaster’s longtime buddy, Steve Story of Tampa, had a computer that needed repairs. He called Reaster and asked him to simply get it running again, so he could donate it. One of several volunteers who helps Reaster, Story said he has lost track of how many computers he has delivered. “There are so many kids who aren’t being paid attention to,” Story said. “They’re not becoming good human beings in our society. They’re getting pulled left and right. We’re giving them a tool to better themselves in school and get better-educated. We can go into the areas where this is not available or the parents can’t afford it. The organization requires long hours and offers no pay, but Reaster seems to love it. He said he eventually wants to align BIKERSCAP with a larger national charity so more children can benefit. Considering his own employment situation, one might wonder why he does it. 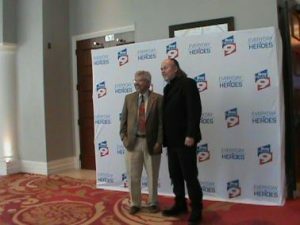 “I might be selfish, but it makes me feel good,” Reaster said. “We’re filling a void. A lot of these computers, they’re throwing them out in the trash. We recycle them for kids to use in their education. We’re basically recycling high-end computers. For information about applying for computers refurbished by BIKERSCAP, or to donate computers, money or other services, visit www.bikerscap.org. Julie Rinaldi, Publisher of the LOLA paper, which is a local publication here in the Land O Lakes, Fl. area (BIKERSCAP‘s Headquarters is located here) ran this story on us on our donation of three computers to children at Locke Elementary School, needless to say, the kids were quite surprised! 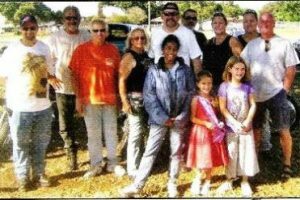 October 13, 2010 was another ordinary day at Mitty P. Locke Elementary School in New Port Richey. At the end of the school day, parents were picking up their children. The buses were all lined up waiting for the kids to get aboard. Needless to say, then, that the loud roar of several motorcycles pulling into the schoolyard took more than a few people by surprise. 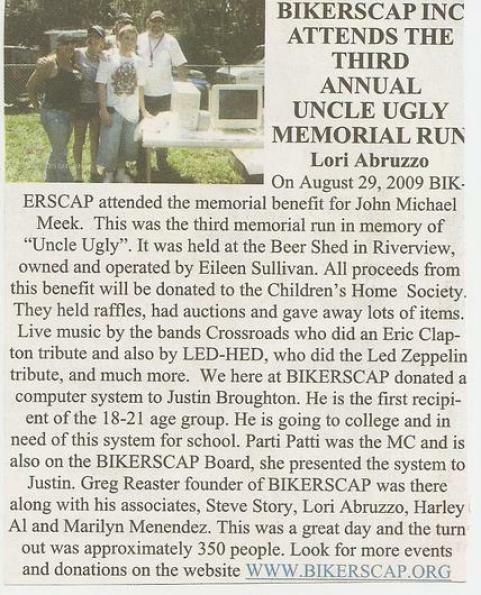 The bikers were members, supporters, and sponsors of BIKERSCAP Inc., and they were there on a special mission. They had been alerted by third grade teacher Nancy Machala, who had notified the group that three of her students were in need of computers to help them keep up with their studies. Of course Machala knew that BIKERSCAP, which stands for “Building Intellect Knowledge Education Resources & Schooling with a Computer Acquisition Program”, is in the business of providing refurbished computers for deserving students who can’t otherwise afford them. The students, Jodie Benitez, Alexis Spivey and Hailey Austin, were unaware that they were going to get computers, so it was a pretty big surprise to them when they were called out to the schoolyard for the presentations. BIKERSCAP can always make use of unneeded computer systems, as well as cash/monetary donations and/or volunteer help please note, BIKERSCAP Inc. is a 501 (c) (3) charity as recognized by the Internal Revenue Code, and donations are tax deductible. Too many times when people think of Motorcycle Gangs they think of big rough guys drinking a lot and pushing people around. Well a motorcycle gang in the Tampa Area is turning heads for a different reason.